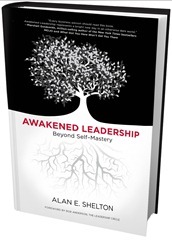 Shelton makes this book on leadership a whole new experience; as he puts such an emphasis on experiencing leadership at the forefront of his book as well. It is not your usual leadership book with traits, how to’s and the usual learning to be a leader stuff you will find in so many other leadership titles. He writes the book with a series of stories, mostly being an auto-biography, as he discovered what leadership truly meant to him in his life and many experiences. His stories are very inviting, intriguing and keep you drawn in to understand more of where the author is coming from in his discovery of leadership and then to see the application side that the book also includes once the concepts are shown from the story perspective. There are some deep questions and exploration of one ‘self’ in this book to see where leadership is sourced from. Ourselves. Shelton shows many insights on that topic and he delivers some powerful stories and conclusions from his experiencing these. He covers a lot of topics that you’ll find in other books, but I personally found a lot of his language to be overwhelming and completely unconvincing. He references the ego countless times, and for my liking anyway, overuses words like manifest, essence, construct, enlightenment which completely distract me from his point, really not following what he seems to be trying so hard to share. He leaves a lot of inconclusive points about his own understanding of things saying how its experiential and cannot be explained, yet this only created a lot more doubt in my mind as to what I could really take away from his book. So, it a great storybook and Shelton definitely has some great leadership insights. The whole aspect of knowing yourself and being authentic, becoming more by accepting things as they occur and not being limited by what you think you need to still develop and to control the ego so that you can simply be, make sense to me already, but I’ve discovered them and learned them from other material and experiences without this book helping that much. I certainly can’t say that will be true for you, as Shelton puts it himself very clearly, each person will have their own leadership discovery and journey so this book might be a great way for you to find some of that out yourself and Shelton’s unique style and stories will certainly leave you thinking. As much as they did leave me thinking, I can’t say I learned much more about leadership or myself from readying this book. To get a better sense of Shelton’s writing, please have a look at his previous guest post here, Learning, Humility and Leadership. New managers are often in a position not because they are ready, training and experience for it, but because they were performing well in a technical role before that. This often leads companies to promote such people to a manager role where it is simply assumed they will know how to manage well also. This is simply untrue and often the reason why so many people think that management or managers specifically do not know what they are doing. I think it is crucial that new positions such as management should be trained for and you should learn from experts BEFORE jumping in and doing everything by trial and error at other people’s expense. Of course there is always room to learn by making mistakes and there will be no shortage of those in a new management position but all the help you can get is important for starting out right and learning to do things well from the beginning. This book is an excellent practical guide to help a new manager do exactly that, start out well by avoiding many common and painful mistakes. The book is well written, and incredibly practical, covering every subject with quick advice and goo recommendations based on the years of experience of the author, David Baker. Baker makes things very real by his honest assessment of what is normal in management, comments about many of the organizational struggles and what challenges you will face as a new manager. I can say I’ve experienced all of these as well and Baker gives quality advice to help avoid them, smooth such problems out fast and manage them well. His direct style of writing makes everything very easy to understand, leaving no room for misinterpretation and he includes plenty of wit and comments about the often laughable situations that need to be managed, that without this guide book, would be much more difficult to handle the first time they are encountered. The book is broken into well organized sections covering everything from how you landed a management position all the way to being a change agent as a manager in your company. 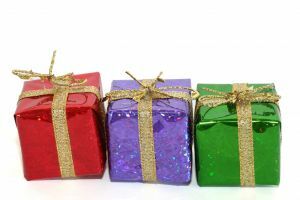 Everything is covered in reasonable sections that often happen chronologically, starting with how to start as a new manager or managing for the first time, through more complex aspects that definitely don’t occur the first few months managing, but perhaps even years later, still important for the manager role however. 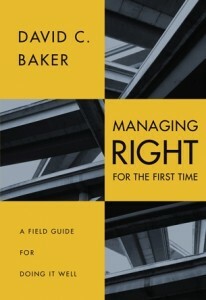 Everything in this book is quite practical and Baker writes it in a easy to apply style that makes things reasonable and understandable. It’s book I will recommend to any new supervisors and managers in my work areas and one I can recommend anyone with aspiring management skills or who needs it for their existing role. It will help you, no matter what your experience level, however, most valuable to new managers. Its a great practical guide and easy to use for whatever topic is thrown your way as a manager. I have read a lot of books on this subject and this one seems to cover the most areas with the best practical ways to apply the skills that many authors cover more in theory, and not in practice. I hope you enjoy it as I did and will make the most of it for your management position. 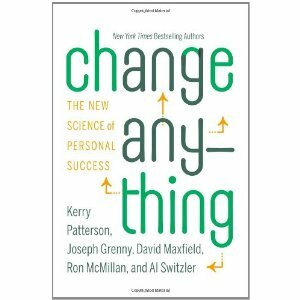 The concepts in these sections all examine personal success and how influence on oneself is what feeds change. Part 1 covers in great detail a section on willpower and the willpower trap. 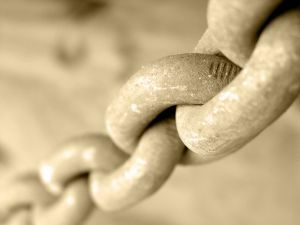 This trap is often thought to be why people can’t change and unfortunately, most people accept this too suddenly and think they know the issue, when in reality, they are blind to the other factors that lock them in to believing the willpower is the limiting factor, leaving themselves in an impossible to break cycle. That’s not a typo, there are two sections dedicated to turning accomplices into friends. Influences are covered from the 3 different sources, personal, social and structural. All of these are explored and the authors present tools to use each influence for good and for the change you want. This guidance itself is worth reading the book for, and it ties in to the whole purpose of the book, to change yourself first and get influence under control so you can change anything. If you are interested in this level of influence, you can read their earlier book as well, called Influence, which I reviewed here. So, overall I definitely recommend this book to any of my readers and anyone interested in personal development, in changing or improving some of their habits and if you are wanting to influence others for good as a result of your own personal development. There is a lot to take in from these authors and a lot of great techniques and guidance to absorb and apply for change. I’m sure you will enjoy it like I have! Using small wins to ignite joy, engagement and creativity at work. 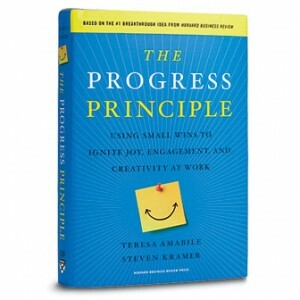 The Progress Principle Principle is explained in this book with thorough research and great examples as forward momentum in the workplace by everyday events that make employee’s inner work lives better. The book looks at helping people finding more joy in their work, break away from obstacles to progress and to instill catalysts for creativity and progress. I personally didn’t find a lot of new inspiring content in this book, but it does cover its subjects well and provide a convincing set of actions anyone could use. I just found that I’ve read so much of this in other books, there were not many new ideas to work from. There are some excellent points in this book about recognizing and making progress, using and bringing leadership to encourage it, finding things that ignite your own work happiness and of course then using other factors to encourage progress. The two big ones of catalysts and nourishment I really liked and are often missing in people’s work lives or workplaces even when there is great accomplishments besides them. Without them however, there is often little or no joy in the work and any progress fades quickly from keeping the workplace a thriving place of enjoyment. I definitely recommend this book to anyone interested in seeking their own progress in their career and especially to anyone who has made good progress, but does not seem to have the joy they want in their workplace. This book will help you recognize what might be missing and to show you ways to bring that into your own work life or workplace. It is probably more suitable to new supervisors or managers but can obviously be useful to any position since leadership can happen at any level, and influence in a leadership position will help you made a bigger impact with these tools from the book.